Epson L120 Resetter Download - when Epson L120 printer has reached and even exceeded the limits of the printing, the green and red lights on the printer blinks called "blinking" and on your computer screen will display a dialog box "Service Required". This happens because the Waste Ink Full, therefore, must do a software reset. therefore, the printer needs to be reset. 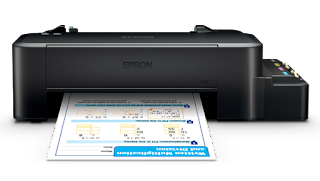 please download the driver first if you do not already have a driver for Epson L120. Run the program in a way Resetter Epson L120 Double click on the downloaded file. If you do not have the software resetter, Download at the end of post below. In the next dialog box click the SELECT button to choose the model printer (L120) to be reset. Once selected Printer (epson L120) Model and Its port then click the Particular adjustment mode. In the next dialog box select the "waste ink pad counter" and then click the OK button. After the dialog box "Waste Ink Pad Counter", tick Main Pad Counter. Well, in this dialog box there are two buttons that check and initialization. Check button is used to check the ink point that has come out of our software that will be reset to 0 (zero), then the Initialization button is used to reset the Pad Counter (main). If successful finish eating reset process by pressing the button FINISH. Epson L120 Printer returned to normal as if it were bought, because its function has been restored to zero.